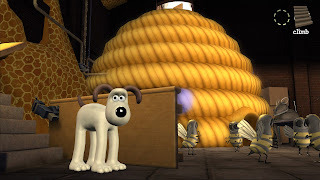 I spent an afternoon (literally) with the first of four Wallace and Gromit's episodic releases from Telltale Games. Subtitled: "Fright of the Bumblebees, this Grand Adventure finds our titular characters starting a new honey business called "From Bee to You", that is immediately tasked with producing 50 gallons of the sweet stuff in a day. A simple task for the inventor of the "Magnatronic Pollenator", a device created to turn ordinary flowers directly into sweet, syrupy bee vomit. But with only a day to deliver, and a severe lack of flora, Wallace must get creative. Stumbling upon an ad for a miracle growth formula (for humans), your job is to track down the necessary ingredients to apply to your garden and speed up the growing process...but as this IS a Wallace story, you can imagine that things don't quite go according to plan. A little history, if you need it - Telltale has most recently released Strong Bad's Cool Game for Attractive People (Ep: 1-5) on the Wii and PC, and prior to that, they created the Sam and Max series. Founded in 2004, Telltale has taken an episodic approach to their premium games. Distributing via PC and other channels (Wii, and Xbox Live Arcade), they expose gamers who may not have had much experience with the classic adventure games many of us have grown up with. 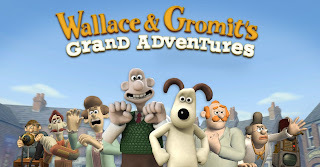 Of course, as cultural icons, most should be more familiar with Wallace and Gromit. 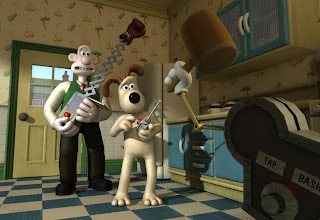 Starting as British "claymation" shorts, and one feature-length film, created by Nick Park of Aardman Animations, the series tells the story of cheese-enthusiast, Wallace, an absent-minded inventor from Wigan, Lancashire and his companion dog, the more intelligent, yet mute, Gromit. The game plays as you'd expect, without treading too far off the beaten path, but that's a good thing. The graphics are beautifully clean, aptly representing the animated series. Telltale did such a good job of capturing the essence of W & G, you can't help get the feeling that you're in one long interactive episode, and by the time it's over (and that doesn't take long) you'll be hooked and ready to start the next episode. 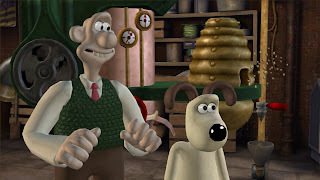 Bottom Line: (8 out of 10) The often hilarious episode is a must-play for fans of high-quality adventure gaming, and/or fans of the Wallace and Gromit stories. 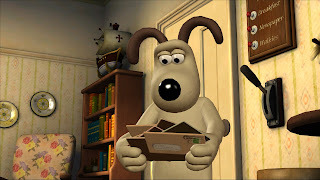 This game is reminiscent of a by-gone era of PC greats that are very few and far between, even with the more child-like flavor of Wallace and Gromit. The gameplay may be familiar, but it's clear Telltale is simply continuing to do what they do best. Be sure to come back next month as we hope to have a review up for the second episode, titled: The Last Resort. Thanks to Telltale Games!